Poweshiek was born in a village where the city of Davenport, Iowa now stands. Armstrong gives the name of the village as Musquaw-kenuk. Other reports give the name of the village as Oshkosh or Morgan. There were two other Meskwaki villages west of the Mississippi, including one where Dubuque now stands. Several hundred people lived in each village. Poweshiek was Meskwaki, a name which means "people of the red earth." They lived near the Sauk, who had villages on the east side of the Mississippi, including Saukenauk, which was one of the largest cities in North America at the time, with as many as 8,000 people. The Sauk and Meskwaki were usually closely allied, and they spoke languages that were similar enough that they could understand each other. The federal government knew the Meskwaki as the "Fox", and involved both tribes as "the consolidated Sac and Fox." The early 1800's, until about 1828 was a time of relative prosperity for the tribes. They lived a seasonally nomadic life style, planting corn (they raised three distinct varieties), beans, squash, pumpkins, and tobacco near their summer villages. In the fall they would cache the crops, then leave the villages and disperse to small hunting camps. In the spring they would harvest maple sap to make into sugar, then they would return to their summer villages. The Meskwaki also mined lead. Julien Dubuque, a French Canadian, obtained permission from the Meskwaki to mine lead, and operated a lead mine near the town that was named for him until his death in 1810. The federal government was negotiating with the Meskwaki prior to the Black Hawk War of 1832 with the hope of purchasing the mines. The Meskwaki knew the mines were very valuable, and were not willing to sell at the price the government was offering. The Meskwaki usually had a surplus of trade goods--furs, lead, corn, and sugar. There seems to be some dispute about when Poweshiek was born. Armstrong claims he was 19 in 1832, about the time he was chosen to be chief. Others have him somewhat older--maybe by as much as 10 years. 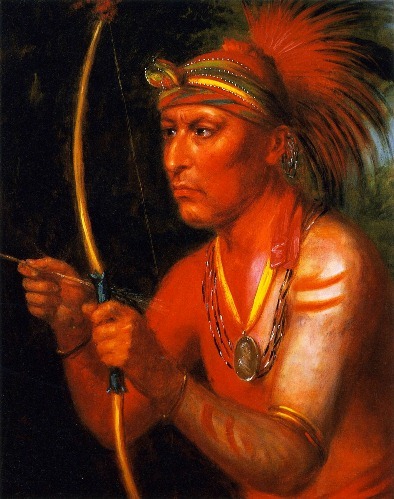 Armstrong's date would have made him 24 or 25 when this painting by Charles Bird King was made, on the 1837 treaty trip to Washington. So Poweshiek became chief when he was quite young, and at that point in time when the infrastructure of "Indian Removal" started to have a huge impact on the welfare of the Meskwaki and other Indian tribes in the area. And shortly after about a dozen of the chiefs and important men of the village had been massacred.